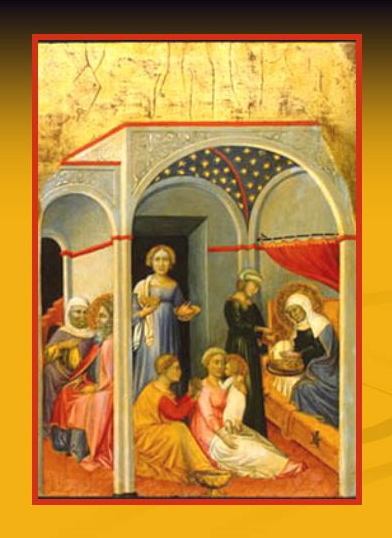 February 18 is the memorial of Fra Angelico. This painting by Fra Angelico depicts St. John the Baptist and St. Dominic. 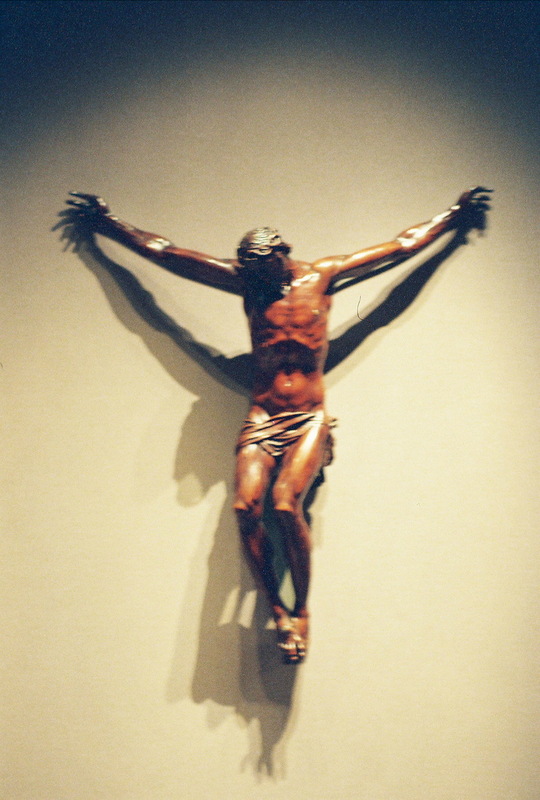 "A solely aesthetic analysis of Christian art is misleading. Christian art is not made for the museums, but for the liturgy. An altar screen can be understood only if it is viewed together with the Eucharist celebrated on that same altar." I should have a group of photos from the Getty Museum in a sidebar gallery some time this evening. All are from the North Building. Photography is not allowed in the special exhibits, such as the one they have now of icons from Mt. Sinai. In the Getty's collections, photography is allowed, but only without flash and without a tripod. This picture is of a small corpus of Christ from Italy, around 1600, made of fruitwood. In between Christmas Eve 2005 and Lent 2006, I took 3 sets of photographs of Church of the Nativity in Rancho Santa Fe, California. Some of the photos are in the sidebar gallery ("Christmas at Church of the Nativity" and "More Photos of Church of the Nativity"). This post is about the meditative process of photographing statues at the parish where I worship almost every week. The photos shown in this post are thumbnails. Click on the photo to see it full size. Those taken with high density film will then be larger than the others. Church of the Nativity has beautiful artwork, old and new, and it has been repeatedly photographed by professional photographers and students of photography. For a look at a couple of professional photographs elsewhere on the web, take a look at the "objects" section under "design on the website of Renzo Zecchetto Architects. 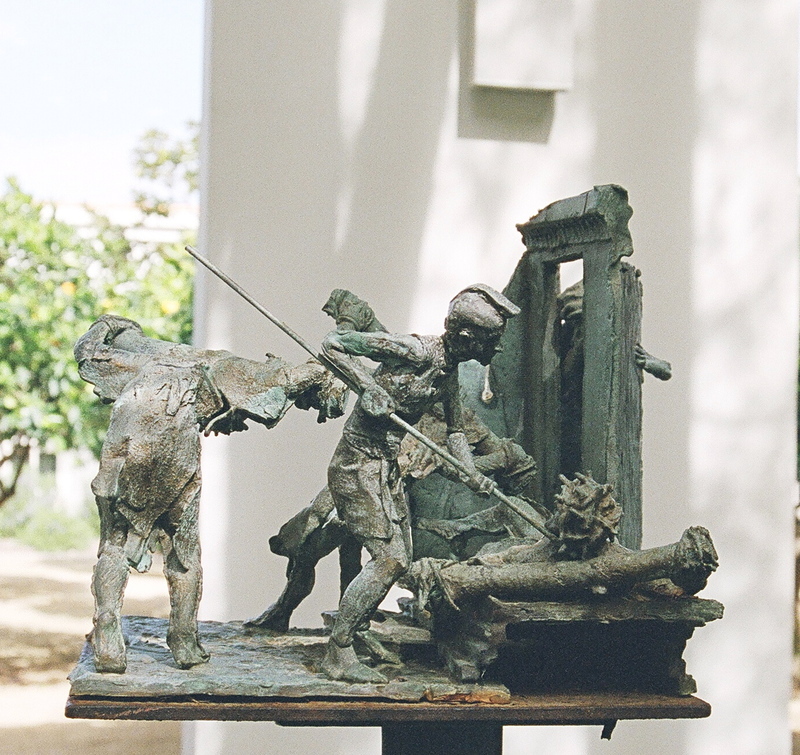 There are photos there of the crucifix and the statue of St. Joseph with candles, both of which include Zecchetto's mix of antique and contemporary artwork. 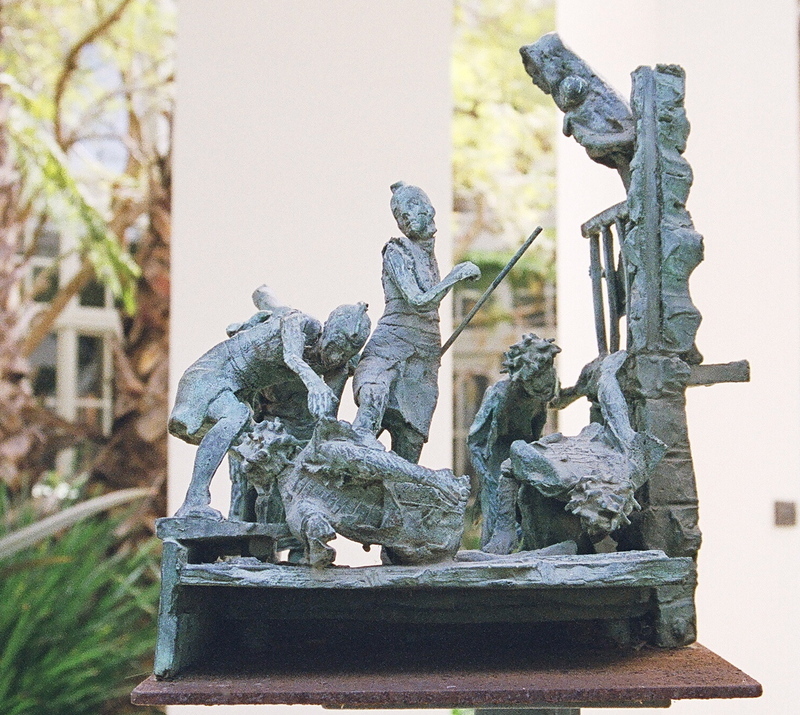 Sculptor Max DeMoss's own website does not presently include photos of his work at Nativity, but it does include professional photos of some of his other church art, from St. Jean Vianney Catholic Church in Baton Rouge, Louisiana and the Cathedral of Our Lady of the Angels in Los Angeles. 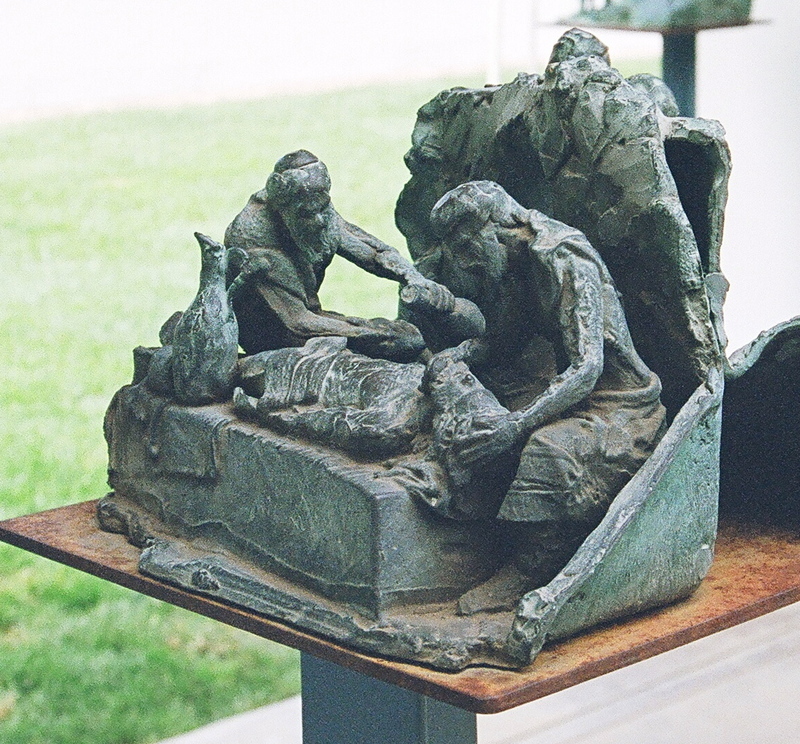 A photo of DeMoss's station 12 from Nativity's Stations of the Cross appears on Nativity's website, which shows the statue from a different angle from the one I used for the photo I posted here of the same station. The photo on the parish website is from a fascinating angle, partly because of the shadows, perhaps suggesting the hour of 3:00 p.m., the time of the death of Christ on the cross. Photographing statues necessarily involves choices, sacrificing one thing in favor of another, because it necessarily depicts a three-dimensional work of art in two-dimensional form. I had to give up an entire dimension, so I had to lose something in the process. 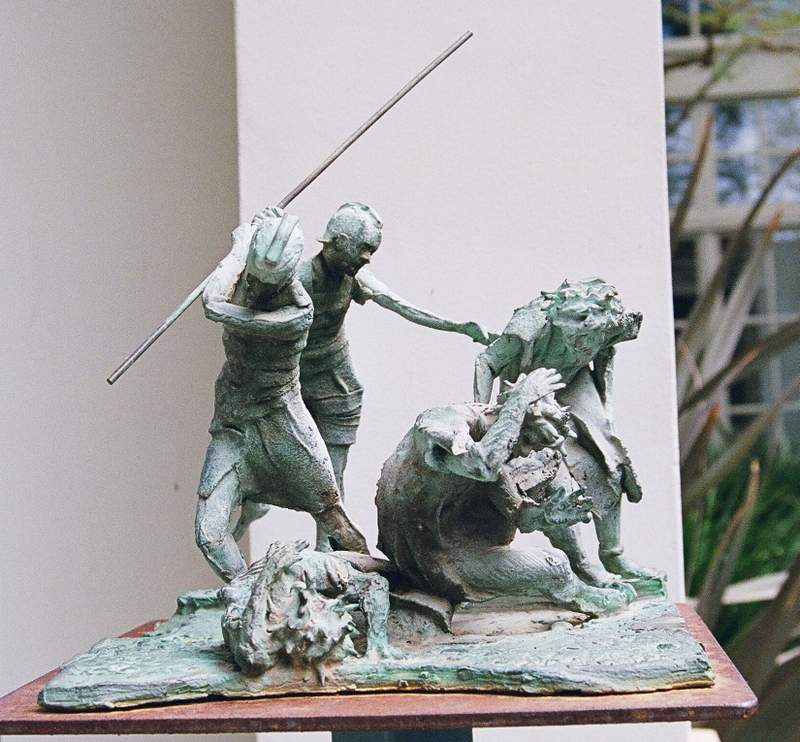 I hoped to add something by depicting each statue from a point of view that added something, that gives the photo value even to people who have already seen the statue. 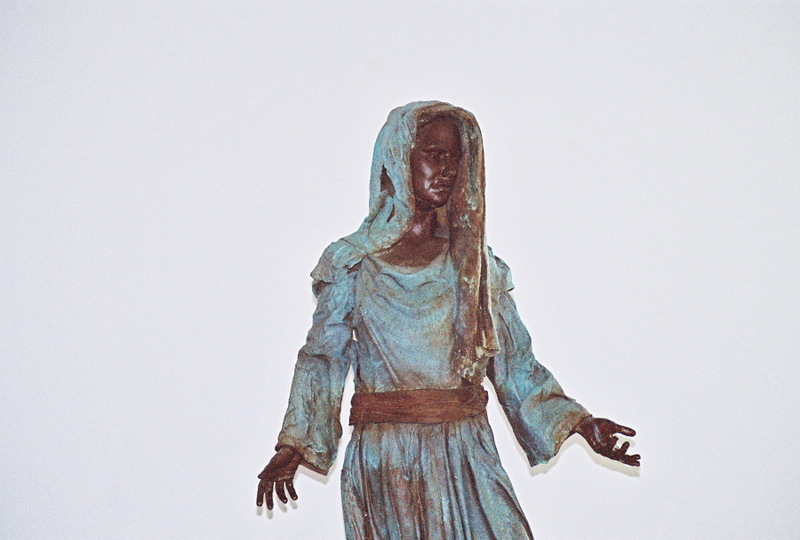 For my photo of Station 12 (photo #1), I found Mary's profile a compelling depiction of her grief at the crucifixion. More recently, I used the photo in a post with a quote from St. Edith Stein about Mary at the foot of the cross. However, in the process of taking the photo from that direction, I almost completely lost the view of St. John, who is behind the two women, consoling the Blessed Virgin. In photo #2 shown here of the same station, you can see all three figures at the foot of the cross, but the background is distracting, and there is no one figure whose grief draws immediate attention as I thought the picture of Mary did in the first. The choices were not always easy or obvious, and the choices I made were not necessarily the same that someone else might have made after giving the matter just as much thought -- or even much more. There is a matter of deciding what is most important, and the process is one of meditation. It is not much different from the process of meditating on Scripture. What strikes me, what has something to say to me in my life, may be different from what strikes someone else. The choices made tell something about the statue, something about the sculptor, and something about the photographer. And in that process, the meditation itself can change the one doing the meditating, as all art that is truly good art tells something about life and reaches something within us and can, and should, change us. 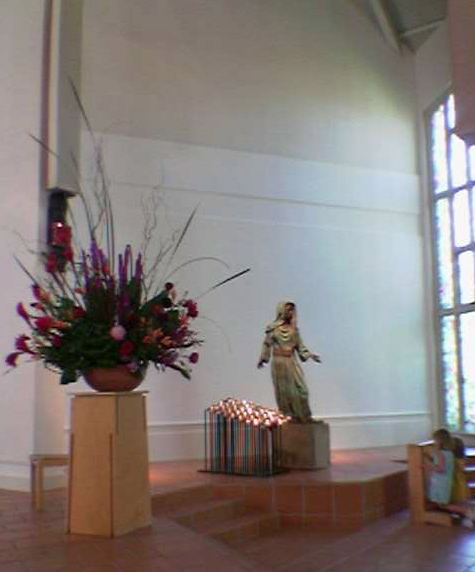 In the photo of the same statue shown on the parish website, taken from yet another angle, all of the individual figures can be seen, with the attention drawn more to the cross itself and the shadows. 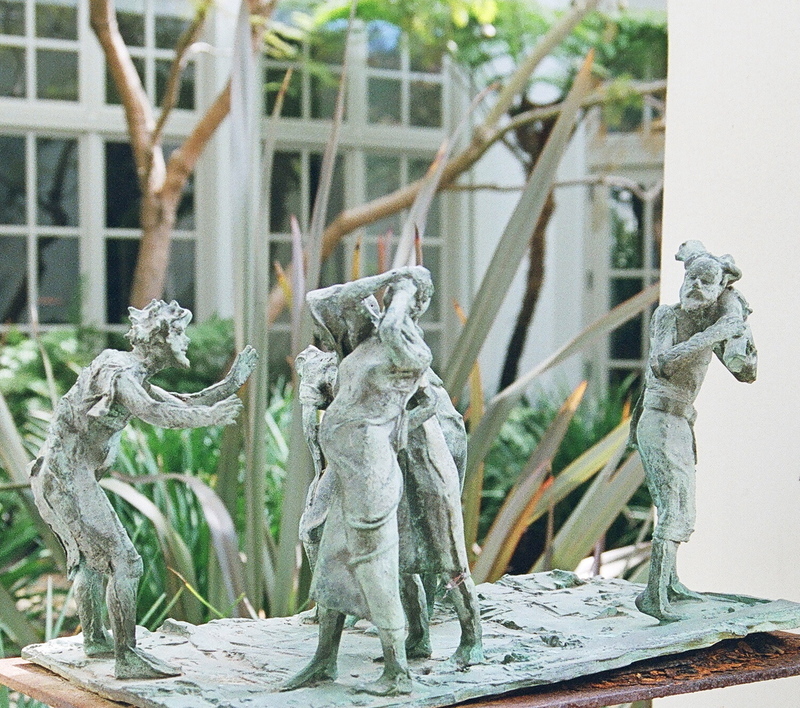 A different focus is given on the same statue, as a great song sung by a different singer. Two Christians meditating on the same Scripture passage can, in much the same way, see different life applications in it and walk away from it remembering different phrases, different verses, as the ones that struck them most deeply. It is an interaction between the subject and the observer, and a different final work entailed in the blend. Walking around the station, looking at each figure individually, it is possible to consider more fully each one of them and what is depicted. Walking around it and thinking about which direction to photograph it from includes that meditation, looking at each face, each profile, and then having to make a choice. The stations are places for meditation. In Max DeMoss's stations, you can see whelps and cuts on Jesus' back, details that you cannot see unless you look at Jesus from the back, and sometimes looking at the statue itself from the back instead of looking at the station from the front. Photo #3 here, station 7, was taken looking toward Jesus' torn back, choosing one of several figures showing him falling on the way of the cross, and choosing to show his back rather than his face in order to show the wounds. The stations, and DeMoss's bronze Madonna inside the church, all are beautiful seen from several different angles, and not just looking at the statues from directly in front of them. 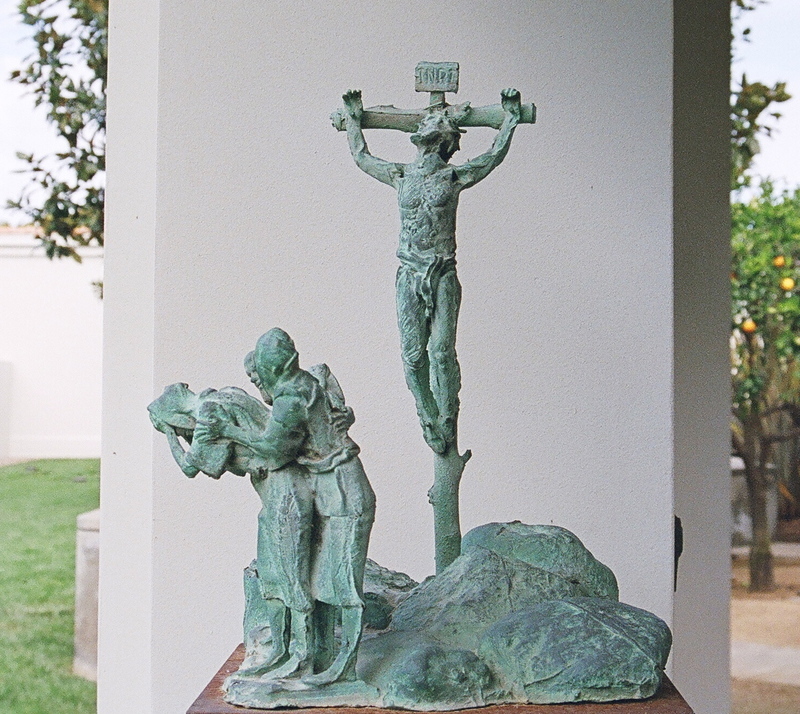 Some of the stations show Jesus in several different positions, as when he fell. 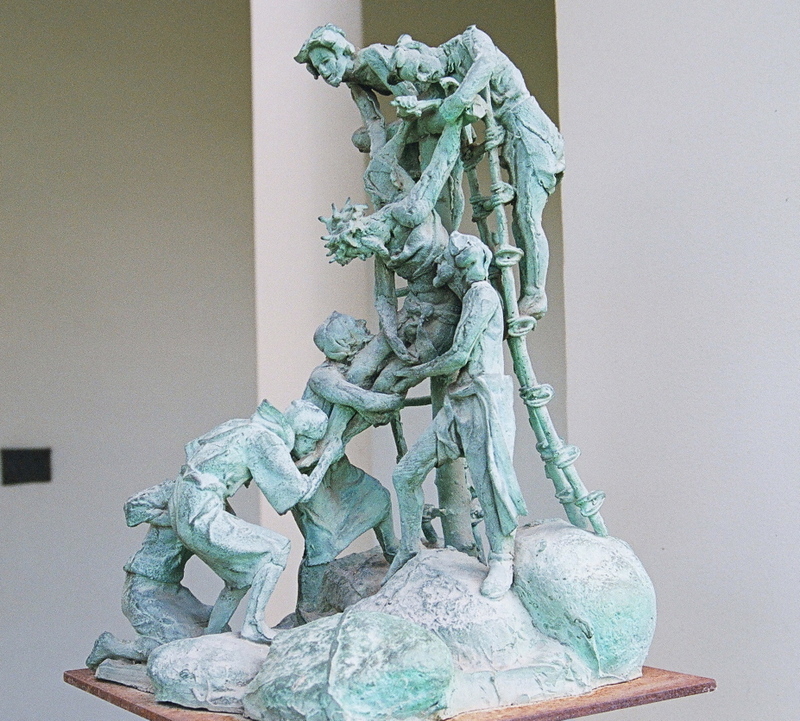 There is motion in the statues, as they show him beginning to fall, falling, and having fallen, in several different small statues assembled together in the one station. Photo #4, station 9, is an example of that. It is not possible to show all of the various positions in one photograph because some are behind the others. 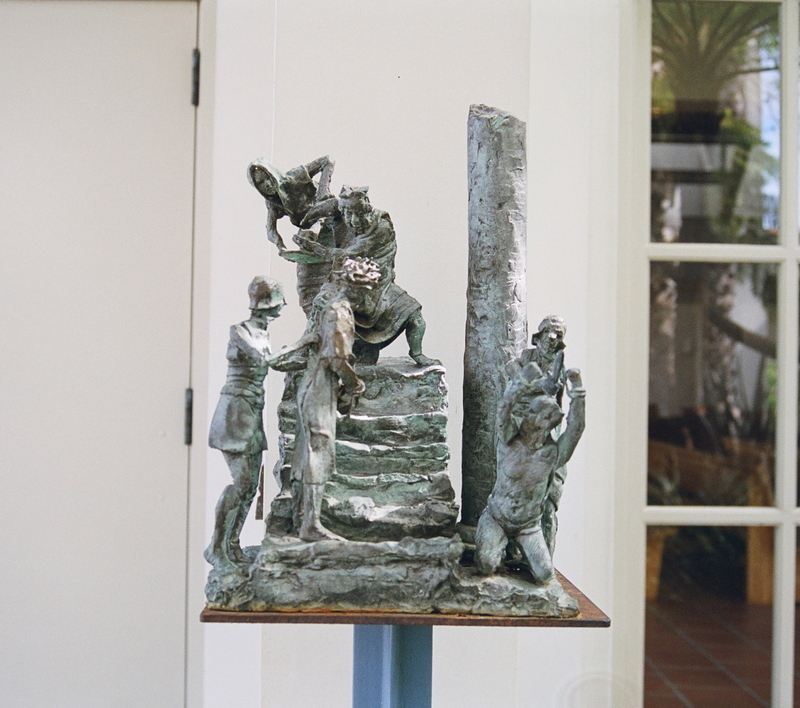 Instead, it was necessary to decide which view was most compelling as a still shot of what has motion as a statue, trying to show some of that motion in the photograph as well. There are other ways of showing motion, using exposure timing and other techniques. 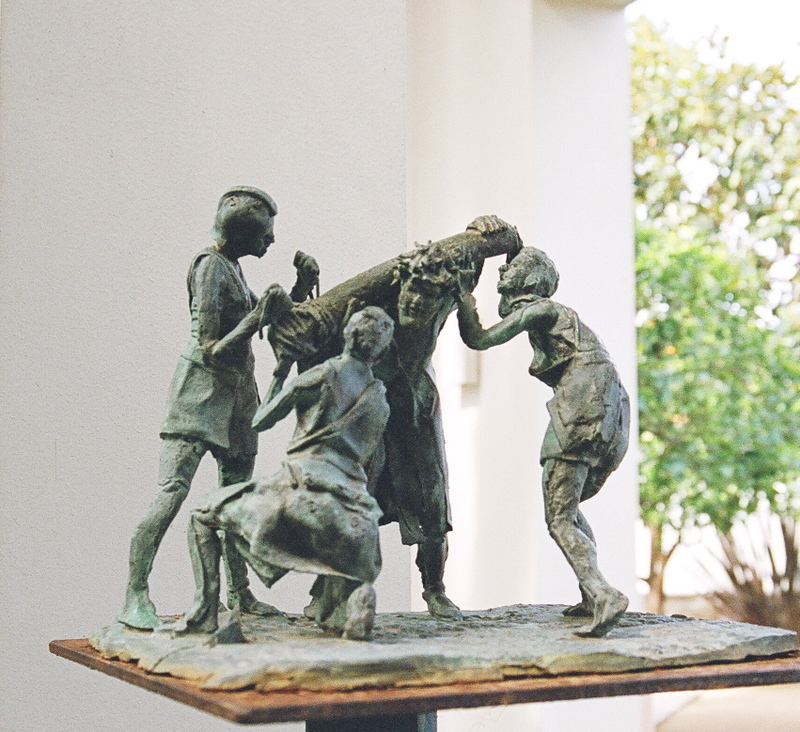 With a statue, the motion is created partly by the artist and partly by simply moving around the sculpture, moving your eyes from figure to figure within the sculpture. With a photograph in mind, I had to move around the sculpture until something struck me more than the other views, until I saw something I thought was worth remembering, and then try to capture that one view in a two-dimensional moment in time. Another problem with choosing views that showed how beautifully DeMoss depicted the women on the way of the cross is that it distracts from the powerful depiction of the men. Station 13 (Photo #5) shows the men taking Jesus' body down from the cross. It is powerful as seen from the walkway where the stations are located, but I stood on the grass to take this photo of the other side of the statue. Only from there can you see the love with which one of the men touches his feet as he helps the others take Jesus' body down for burial. Similarly, the more noticeable side of station 14 shows the women waiting at the entrance to the tomb, while the other side (photo #6) shows the men inside preparing Jesus' body for burial as they laid Him in the tomb. Showing both gave me 15 photos for 14 stations, but the hidden view of the men -- not as readily visible as we walk down the walkway toward our chapel -- was worth seeing. The Madonna, at the Mary altar (photo #7), also cast by DeMoss, is my favorite work of art at Nativity -- maybe just a slight favorite over the very old bronze statue of Jesus on the crucifix. That should come as no surprise to anyone who sees how often I use photos of both of those statues here. 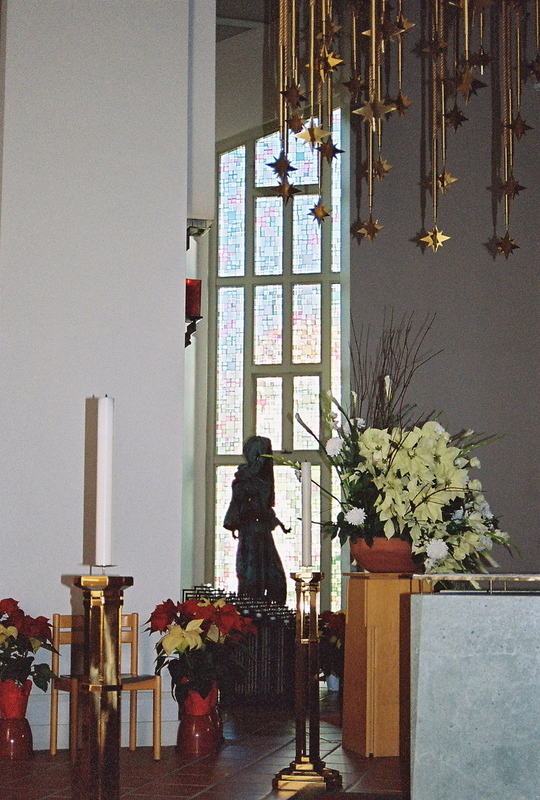 There is a similar Madonna at St. Jean Vianney Catholic Church in Baton Rouge, Louisiana, shown on DeMoss's website. Ours is thinner, and her dress looks more modern. A year or two ago, when I was still fairly new as a parishioner there, we had a visiting priest, an author, who gave a series of talks and mentioned one evening that he thought thin, young depictions of Mary might send the wrong message to young women in an age when we already put too much emphasis on physical beauty. He said that, by the time of the crucifixion, Mary actually was probably a short, pudgy, middle aged Jewish woman. He may have been correct, but the thought popped into my head of a short, pudgy, middle-aged Jewish Mary sitting in the pew behind me, leaning forward and whispering in my ear, "Well, I think it looks exactly like me!" And I realized then that there was something I understood about short, pudgy, middle-aged women that perhaps a monk would not have considered. 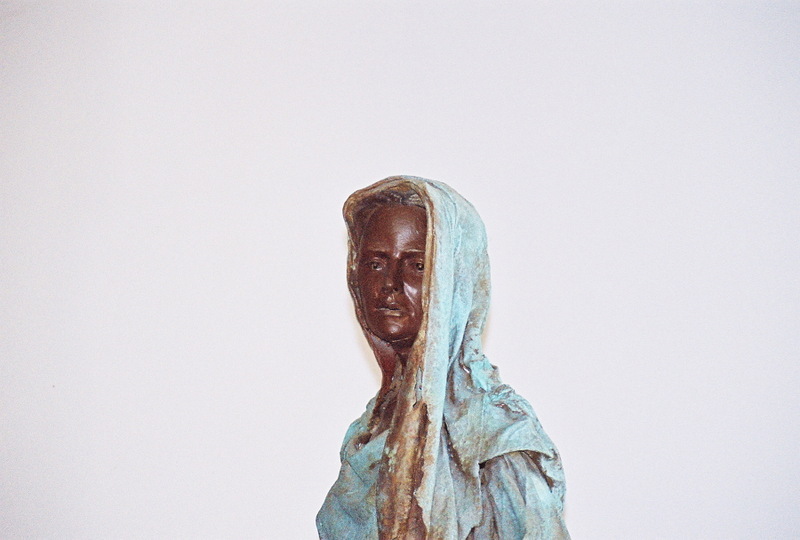 When I realized that Mary could have thought the statue was flattering, and could have accepted it as an honor to herself, it never bothered me again. Like the stations, the Madonna is very three dimensional. One of my favorite photos shows just her face, looking at her from the front of her face (photo #10), and another shows her face and hands (photo #8). "In iconography, Mary’s face and hands reveal her contemplation and constant pondering of God’s will and her openness and resignation (open hands) to accepting His will for her life." So said the Sisters of Saint Basil in Uniontown Pennsylvania in their News of the East about a pilgrimage in 2002. 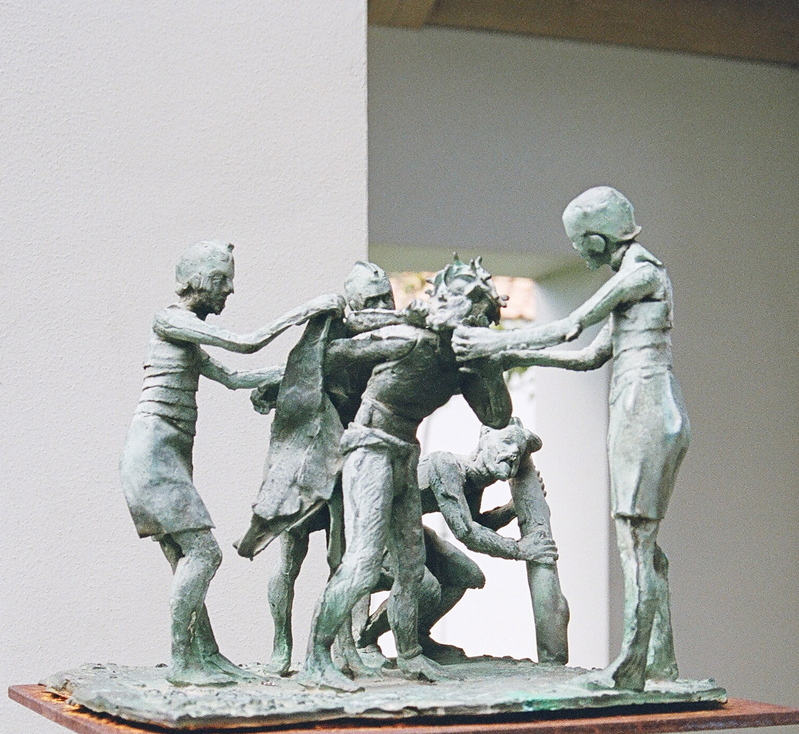 Viewed from one direction, both hands seem to be reaching out, in this "openness and resignation." From another, her right hand seems to be almost at her side, open, while the left hand reaches out to someone standing nearby. In a photo taken from the nave recently (photo #9), she seems to be reaching out to two young girls together sharing the kneeler near her, as if inviting them to prayer. Candles are lit. All of the candles were probably lit that morning, as we sometimes run out of unlit candles by the end of Sunday morning Masses. The presence of the people makes an enormous difference to church art. It is a very different thing to see art that has become a part of the lives of the parishioners who see this particular depiction of Jesus and that particular depiction of Mary every week, or even every day, so that it becomes a part of our own faith as it affects the way we think of Jesus and Mary. A statue in Catholic or Orthodox Church art is really a different artform from a statue meant to be seen for its own sake. Church art is meant to be seen for its impact on the faith of the viewer, on the viewer's love for the Lord. It only has that impact when it is taken into the life of a congregation. That is true not only for lesser known works of art, but even for the major ones. The Pieta of St. Peter's Basilica, for example, has an impact on the lives of people from all over the world who visit there that differs from the impact of statues in museums and other less personal, less intimate environments. Our statue of Mary looks like one of us from a distance. Seen in profile against the light of the stained glass window (photo #11), she looks almost like part of our parish, the person you might go to if someone ran out of wine at a wedding. I also wondered about the process by which a sculpture goes from being an artist's artistic creation to being a parish's view of Jesus or Mary. At some point, it seems to me, the artist becomes something like a father, or even a father of the bride, as the creation he worked lovingly to create becomes someone else's picture of the Lord or of His Mother. In time, the impact of the artwork on those people who live with it from day to day, whose faith is impacted by it, must become greater than the impact of the artwork on the artist. That does not really happen with art in museums or commercial buildings, and probably not with most art in private homes. It does happen with art in churches. 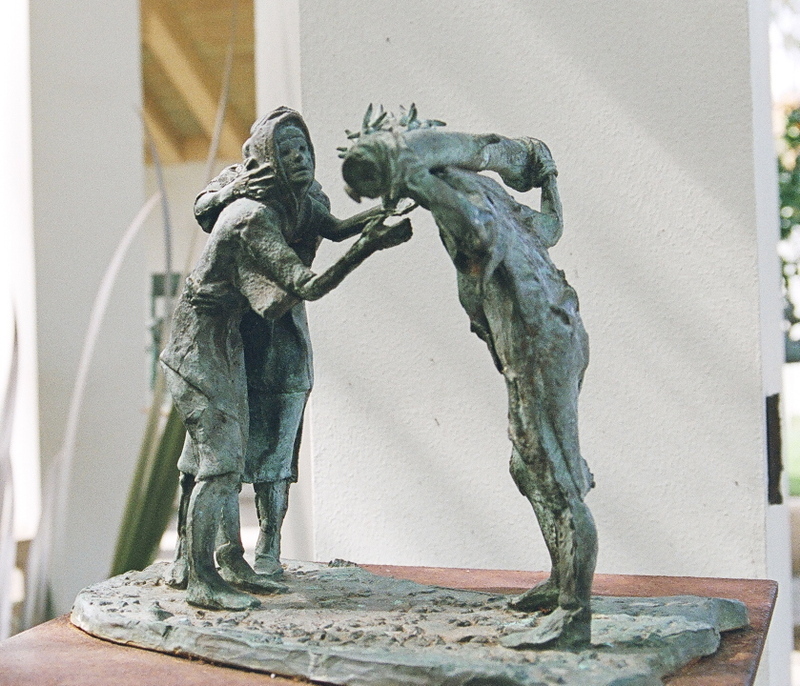 In time, the emotional identification that the congregation has with the statue in a church may become a stronger connection than the emotional identification that the artist had as he or she created the art. It is a different thing to create a work of art for the purpose of letting it go, and letting it impact the hearts and faith of others, perhaps at some point even more than it reflects the heart and faith of the artist, and perhaps in ways that the artist never imagined. In trying to let my own meditation on the statues show through the photographs, one of my hopes was to be able to convey that impact as well as the beauty of the statue in itself. Beyond that, in writing this post about the process -- not a post by a professional photographer but rather a post by a parishioner who took photos of the statues I know from the parish where I worship -- I hope to share a little bit about the process of meditation and about the value of art in churches. If you would like to see the stations together with quotations and Scriptures that I chose to go with them, in order from Station 1 to Station 14, there is such a post under the category "Lent" (see sidebar). Photos: (1) Station 12, (2) Station 12, (3) Station 7, (4) Station 9, (5) Station 13, (6) Station 14, (7 through 11) Mary. "Thy nativity, virgin Mother of God, has brought joy to the whole world; for from thee has come forth the Sun of justice, Christ the Lord, Who putting away cursing bestowed blessing, and by overcoming death obtained for us life eternal." The feast of the Nativity of the Blessed Virgin Mary is September 8. The picture is The Nativity of the Virgin by Andrea di Bartolo, ca. 1400. It is used with the permission of the National Gallery of Art. 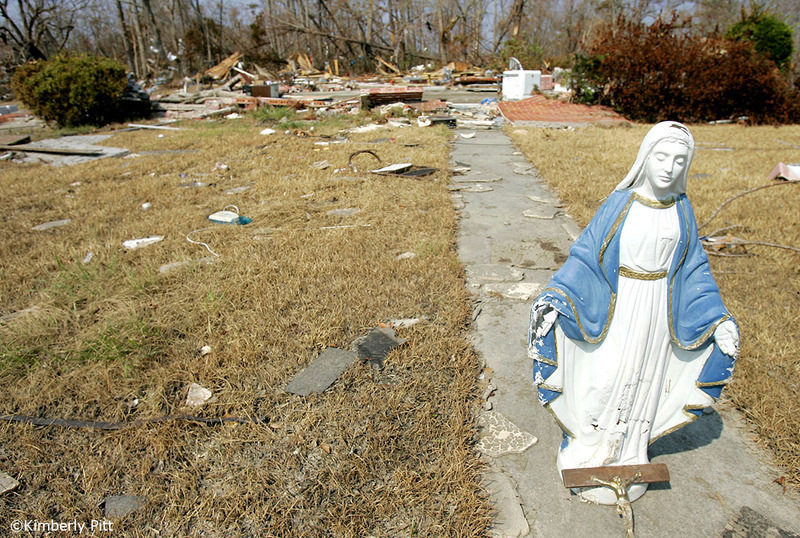 This past Sunday, Catholic parishes in the U.S. collected money to help with the uninsured portion of the Hurricane Katrina losses of Catholic churches, schools and religious houses in Mississippi and Louisiana, as discussed in this previous post. At our parish, we were also treated to a gallery of photographs of the Hurricane Katrina area, taken by photographer Kimberly Pitt. The photographs can also be seen in two photo essays on her website. They include one essay of varied Hurricane Katrina photographs and another specifically of photos of Our Lady of the Gulf. 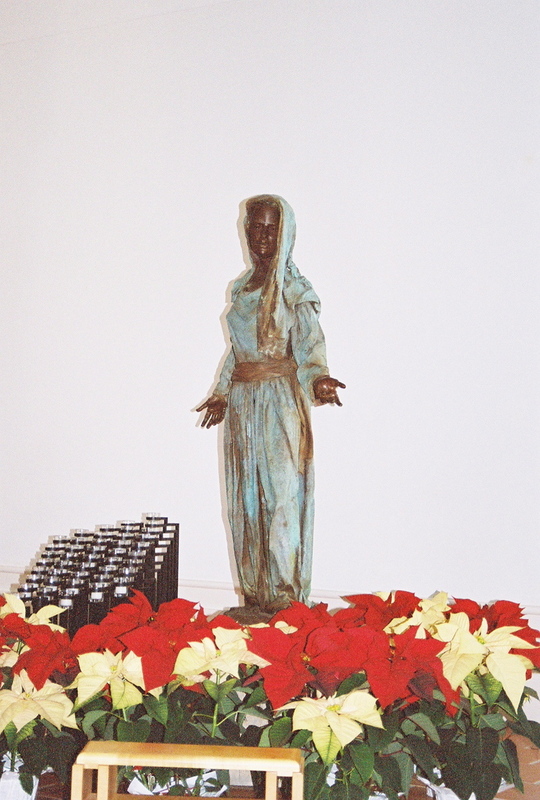 The photo shown here is one of her photographs in the "Hurricane Katrina" gallery, showing a statue of Our Lady where it was found after the hurricane. This photo was taken September 14, 2005. Our Lady of the Gulf is a Catholic parish in Bay St. Louis, Mississippi, a city on Saint Louis Bay and about 60 miles from New Orleans. Before the hurricane, Bay St. Louis was known for its community of artists living by the sea. The parish website for Our Lady of the Gulf has photos of the church before the hurricane. Please go to Kim's website and enjoy her very moving photographs of the hurricane area, as well as the other striking photos in her online collection. August 29, 2006 is the one-year anniversary of the date when the hurricane made landfall in Louisiana. August 27 is the one-year anniversary of the date when it hit Florida, killing 11 people. The disaster is being remembered on both dates this year, particularly as August 27 fell on Sunday. The photo shown here is used by permission from Kimberly Pitt. "I don't have authority to teach about the faith, but I can ... offer something that allows the viewers the opportunity to reflect and connect with their own faith." That article also mentioned Hiemer & Company Stained Glass Studio of New Jersey, which began with George Hiemer's work in the 1890's and early 1900's. 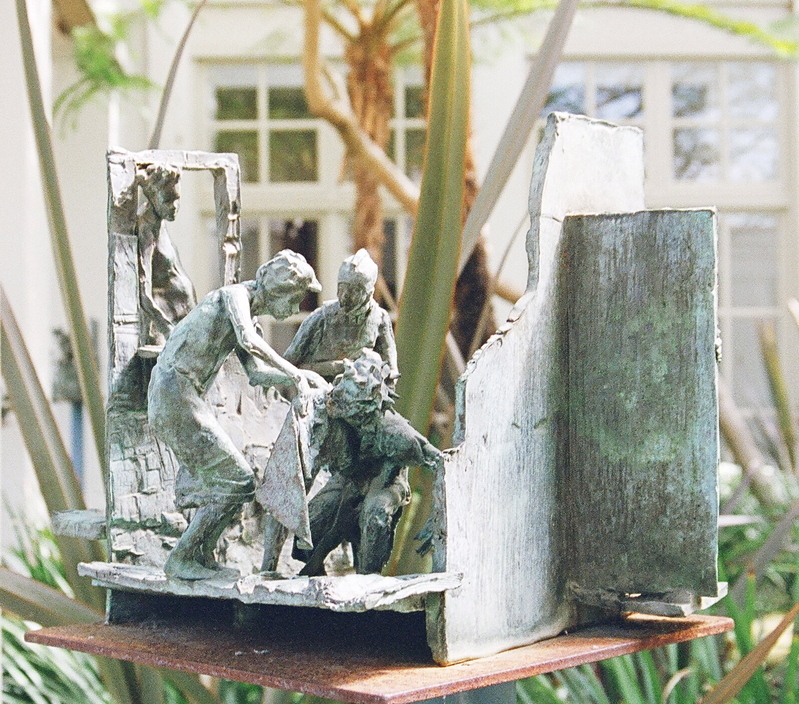 The studio is currently run by Hiemer's great-granddaughter Judith Hiemer Van Wie, and her husband James Van Wie. One of Coombs' projects is St. Mary's Cathedral of Portland, Oregan. There is a gallery of her work on a new Coombs Criddle website. There are good photos of the windows on page about the cathedral. The Hiemer & Company website has photos of their work and a page about the process of creating a stained glass window. 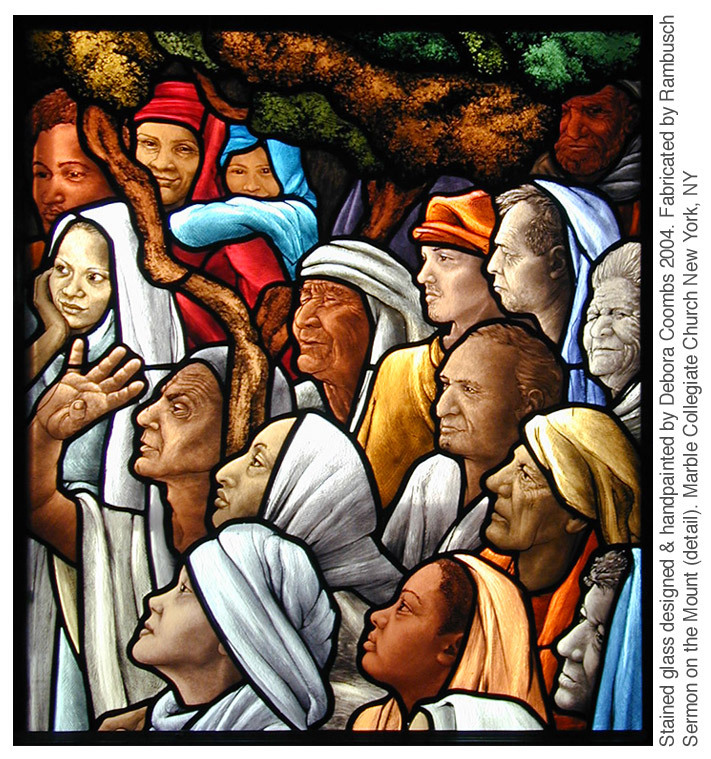 Picture: Detail from "Sermon on the Mount" stained glass window by Debora Coombs. The photo is copyright protected and used by permission of Debora Coombs. Station 1: Jesus is condemned to death. 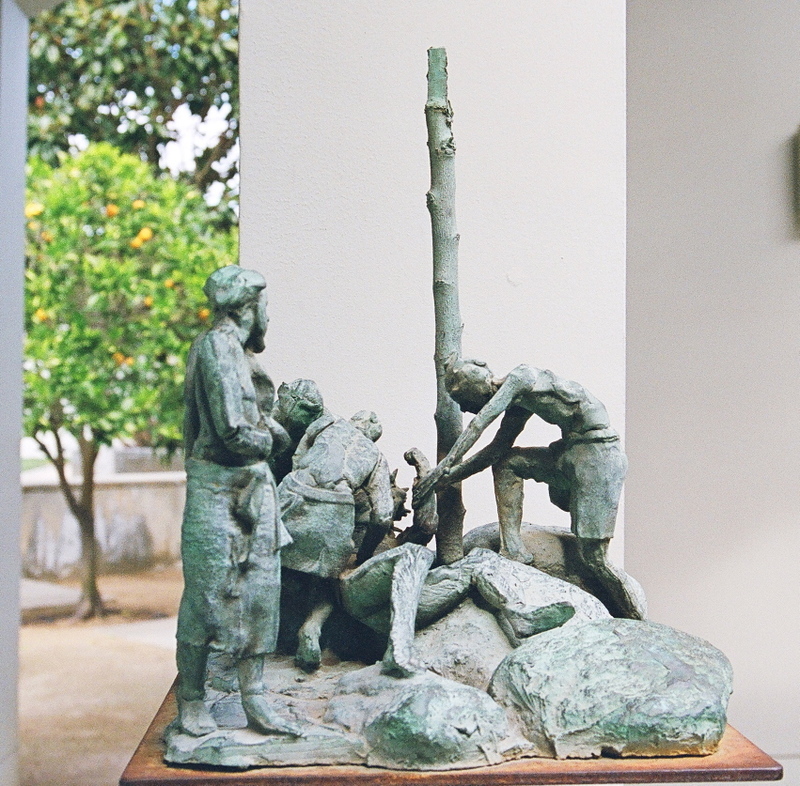 Station 2: Jesus carries his cross. "Holiness is not the luxury reserved for a few favourite persons. All are invited to be holy. I think only holiness will be able to overcome evil and all the sufferings and miseries of the people, and of our own lives. Because we too have to suffer, and suffering is a gift of God if we use it in the right way. The cross must be there, so let us thank God for this." (Bl. Teresa of Calcutta, The Joy in Loving: A Guide to Daily Living, pg. 342. Station 3: Jesus falls the first time. "He who follows Me, says Christ our Saviour, walks not in darkness, for he will have the light of life. These are the words of our Lord Jesus Christ, and by them we are admonished to follow His teachings and His manner of living, if we would truly be enlightened and delivered from all blindness of heart. Station 4: Jesus meets his afflicted mother. "She herself stands at His side like the Church, and assists in His work of redemption like its prototype, the Mother of God, in whom it has its origin. The complete surrender of her entire life and being is to live and work with Christ; but that means also to suffer and die with Him -- that fruitful death from which springs the life of grace for all humanity." (St. Edith Stein, "Church, Woman, Youth", from Essays on Woman. 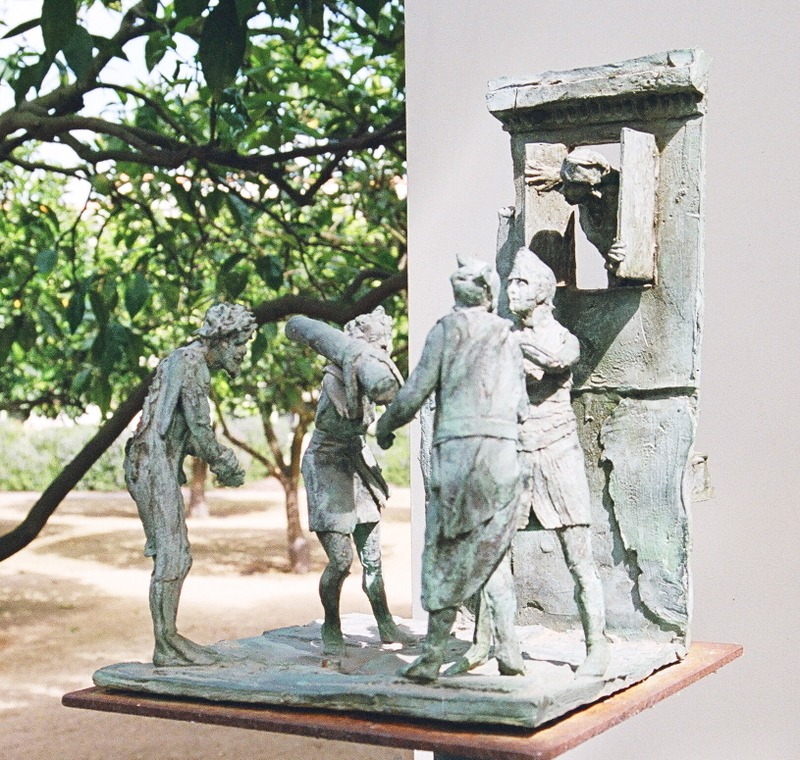 Station 5: Simon helps Jesus carry his cross. "Never omit carrying a corsage of the holy sufferings of Christ on the Altar of your heart, gathering the flowers in the morning in the flowering meadow of the divine mysteries undergone for our salvation by the Son of God. In that way you will always keep burning the fire of holy love." (St. Paul of the Cross, Letter 525 to Thomas Fossi, March 16, 1748, Vol II, The Letters of St. Paul of the Cross. "A Christian is never alone... If you feel abandoned, it is because you do not want to look at that Christ who is passing so close to you... perhaps with the Cross." (St. Josemaria Escriva, The Way of the Cross, Station 6. "Have great love for trials and think of them as but a small way of pleasing your Bridegroom, who did not hesitate to die for you. 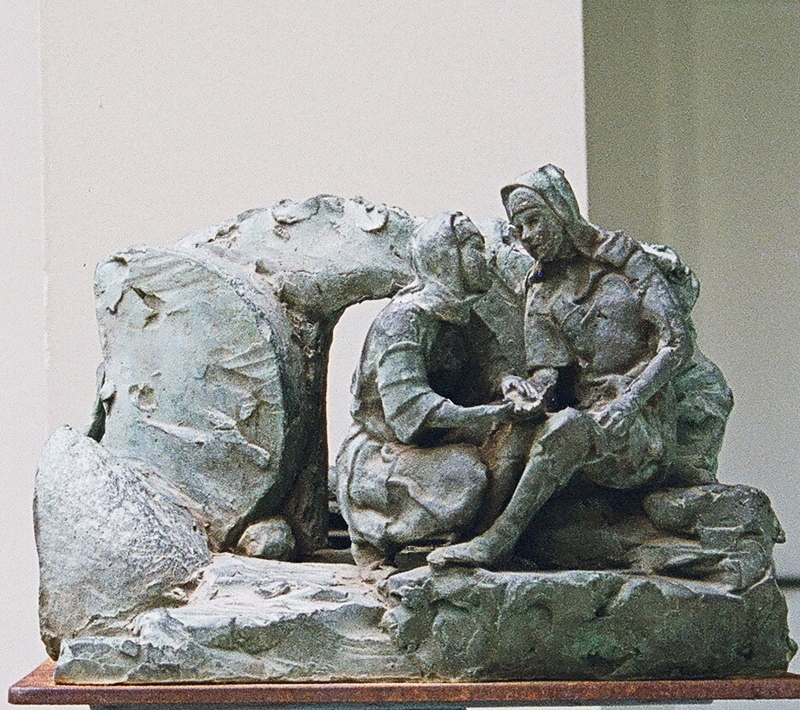 Station 8: Jesus speaks to the holy women. "[F]or when we have many things to do, when we are persecuted and in trouble, when we cannot have much rest, and when we have our seasons of dryness, Christ is our best Friend; for we regard Him as Man, and behold Him faint and in trouble, and He is our Companion; and when we shall have accustomed ourselves in this way, it is very easy to find Him near us, although there will be occasions from time to time when we can do neither the one nor the other. 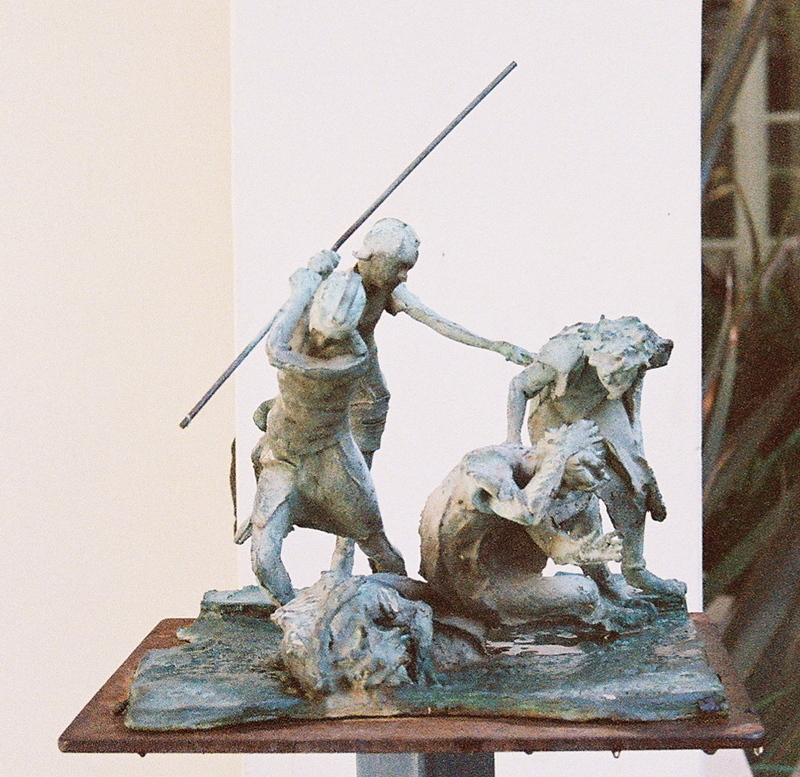 Station 10: Jesus is stripped of his garments. Station 12: Jesus dies on the cross. "These created things should have and could have been obedient to their own Lord and maker, and not to the creature who was misusing them. But the most profound, most faithful, and totally extraordinary humility of this most high and majestic God deflates and confounds our pride-filled nothingness! The very author of life, who alone is, wished to be annihilated and made subject to all creatures, even the insensible ones, so that you, who were dead and had become insensible to divine realities, might have life through his humility and abasement. And you, O man, who were nothing, know that he, who alone is, has loved you with a love so pure and so faithful that solely out of love for you he wished to be annihilated, in order to give you most perfect being." (Bl. Angela of Foligno, The Book of the Blessed Angela (Instructions), Instruction XXII. Station 14: Jesus is laid in the sepulchre. “'But Joseph went, and begged the body.' This was Joseph, who was concealing his discipleship of late; now however he had become very bold after the death of Christ. For neither was he an obscure person, nor of the unnoticed; but one of the council, and highly distinguished; from which circumstance especially one may see his courage. For he exposed himself to death, taking upon him enmity with all, by his affection to Jesus, both having dared to beg the body, and not having desisted until he obtained it. But not by taking it only, nor by burying it in a costly manner, but also by laying it in his own new tomb, he showeth his love, and his courage. And this was not so ordered without purpose, but so there should not be any bare suspicion, that one had risen instead of another. Photos: The bronze stations of the cross shown here were cast by Max DeMoss for Church of the Nativity, Rancho Santa Fe, California, and were photographed there on February 26, 2006. You can also see them in the photo album in the right column of this blog. The Feast Day of St. Willigis is February 23. 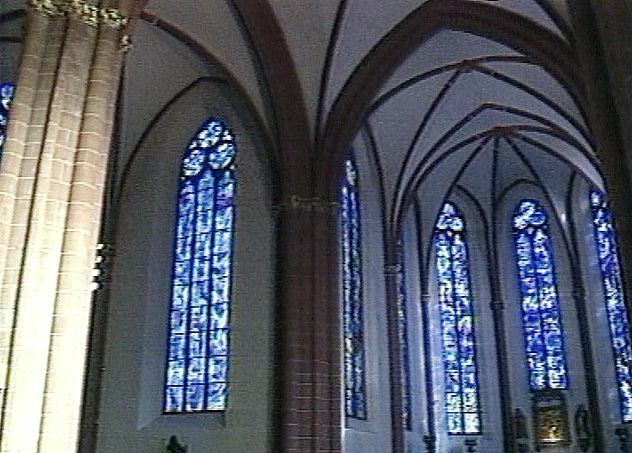 An earlier post mentions the churches built under his direction when he was the archbishop of Mainz, and his motto "By Art to the Knowledge and Service of God." Today's post shows some of the artwork from his era, which was a time of renaissance in Church art and music. I have also added several quotations from letters written to Archbishop/Saint Willigis from the Letters of Gerbert of Aurillac. The artwork shows some eastern influence that had reached the region by way of Italy. It also might give a different view of the late tenth century to some people who think of it only as the "Dark Ages". For an earlier post on this blog about the musical advances in chant around the year 1,000, go here. Photo: Saint Foy of Conques, IXth or Xth century, gold on wood, photo from University of Miami School of Architecture Page. 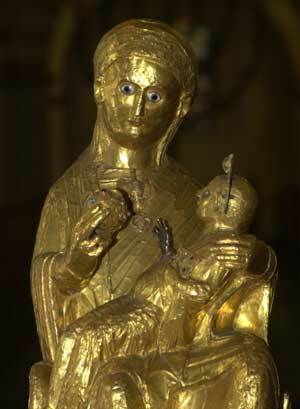 Photo: The ivory madonna of Mainz, Xth century, now on exhibit in the Landesmuseum of Mainz. It may have been originally from Trier. "Advise me, father, for even if I possess no merits in the sight of Your Majesty, my affection has not been absent, nor will I fail in achievement if fortune should smile as formerly. . . . Thus you alone will bear my burden because I have not cared to communicate with my friends the princes until I should try what could be done through him [Willigis] whom I judge most influential." "In a noteworthy speech you declared holy friendships and close fraternal association to be as sweet as they are useful, and you have deemed me worthy, both now and for the future, to be an associate and companion in the Divinity's great reward. For what else is true friendship except the especial gift of the Divinity?" - Gerbert of Aurillac, letter to Archbishop Willigis, September 21, 997, Letter No. 228 as translated by Harriet Lattin. "In great constancy must we work, father, in order to maintain a plan of peace and leisure. . . . [B]ecause not for nothing has the Divinity bestowed on you knowledge and power, indicate to us in safe replies what you approve in these suggestions, and wherein you think contrariwise, as well as what persons favor your ideas and what ones disagree with you." - Gerbert of Aurillac, letter to Archbishop Willigis, March 17, 984, Letter No. 35 as translated by Harriet Lattin. This coming Thursday, February 23, will see the feast days of two saints that particularly interest me. One of them is Polycarp, the disciple of St. John who in turn influenced St. Irenaeus. The other is Willigis, who was the archbishop of Mainz in the late tenth century. I will have some posts about Polycarp later in the week. Since I want to post on Polycarp then, I will go ahead and post a couple of things about Willigis before then. The "Saints of the Day" page for February 23 has information about both of them here. 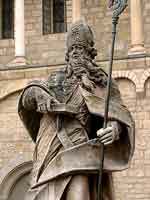 The Catholic Encyclopedia page about St. Willigis is here. Besides having an interest in the history of the late tenth and early eleventh century, my thinking about Willigis is influenced by the time I spent in Mainz several years ago. St. Willigis was the archbishop of Mainz who built the two cathedrals there, although little is left from his construction. 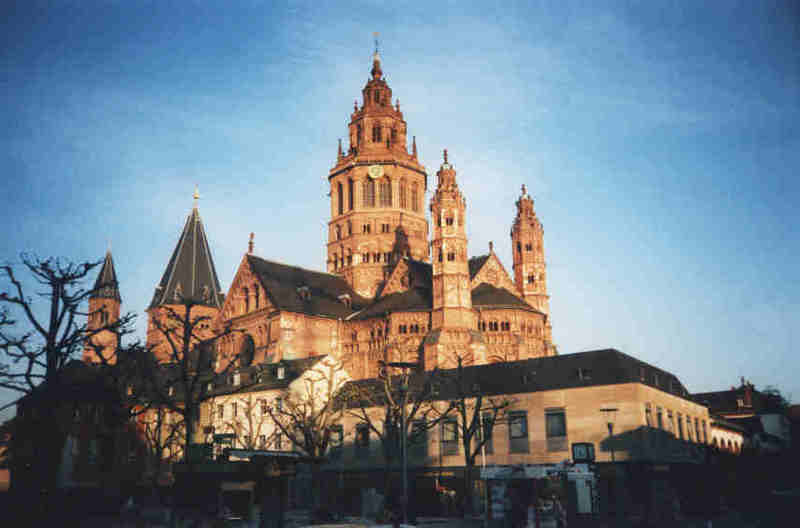 The primary cathedral (St. Martin's, the one most often called the Cathedral of Mainz or the "Mainzer Dom") was built under Archbishop/Saint Willigis from 1000 to 1009, and then burned to the ground on the day when it was to be consecrated. Willigis decided to rebuild, but he did not live to see it finished. Most of the present building was constructed between 1100 and 1239, and there is Gothic construction that is more recent still. A map of the interior, in one of the booklets I purchased in Germany, shows which parts of the present day cathedral were built in different centuries. There is one wall of St. Gotthard's Chapel -- the wall closest to the cathedral -- that dates back to that early construction, parts of two towers at the other end of the church, and a little more, that dates back to 1009. Outside of the cathedral is a statue of St. Boniface, the English-born missionary who was called the first archbishop of Mainz, although the city was not officially an archdiocese until after Boniface's death. At the time of that trip, my thinking was that I could buy better pictures than I could take with my own camera, so I did not carry a camera around with me much. As a result, the pictures I have here were all borrowed from the internet (sources are listed below). One of them is from the home page of someone in Germany who had a nice gallery of pictures he took of his country. Another is from a website in a language that I cannot read at all. The other pictures are from websites of the City of Mainz and what appears to be an educational site featuring Mainz for February. Mainz is, by the way, a pleasant place to spend a vacation. Not far from the Frankfurt airport, Mainz has an old town area of shops and restaurants where the local people spend relaxing week-ends, as well as important historic sites and museums. Gutenberg lived there, and the Gutenberg museum houses handwritten manuscripts from before the age of the printing press, two original Gutenberg Bibles, and a collection of Bibles and other books printed in eras since then along with printing presses from over the centuries. Mainz is also close to Bingen, Worms, and other areas with Catholic historic places, and the people are very friendly and welcoming. While Rome is a terrific place to see things from the Early Church and the Renaissance, Mainz is a better place to see things from the middle ages, and there is quite a lot to see. In its day, the Archdiocese of Mainz was one of the most important positions in the Church and Empire. And yet, today, it is no longer an archdiocese at all, but rather a diocese. And the city is no longer a massively important city politically, but more or less a pleasant suburb of Frankfurt. People live there or spend week-ends there, and they take the commuter trains into Frankfurt to work. But back to Willigis. His slogan was "By art to the knowledge and service of God" and he built two cathedrals, along with much else that he did. St. Willigis was the son of a wheelwright, one of a handful of people in his day who rose from a background of little to great prominence. Gerbert of Aurillac was another. While Gerbert and Willigis were allies in support of Emperor Otto III, Gerbert was later called upon to judge between Archbishop/Saint Willigis and Bishop/Saint Bernward of Hildesheim in a dispute about the jurisdiction over a convent of Gandersheim. As the pope deciding between a bishop and archbishop, Pope Gerbert (Sylvester II) decided in favor of Bishop Bernward, and Archbishop Willigis later acknowledged that the decision had been right. Both Willigis and Bernward were later considered saints, and both have saints' days today. Both were known as supporters of the arts. St. Bernward's memorial is November 20. Gerbert was never beatified or canonized although his intellectual influence remains. 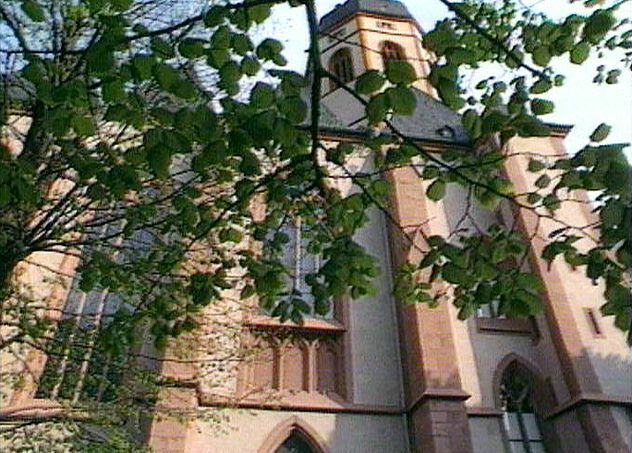 The lesser of the two churches called cathedrals in Mainz is the Church of St. Stephan's, which a mile or two away from the center of Mainz. The original St. Stephan's was founded in about 990 under Archbishop Willigis. The present day Church of St. Stephan's was built, from about 1290 to 1340, on the foundation of the tenth century church, and then burned during World War II. The exterior walls now look the same as the exterior walls in photographs that show the flames shooting out of all the windows of the medieval masterpiece during the war. But the interior, rebuilt after the war, still has a new church feel to it. While the Mainzerdom (St. Martin's) is full of monuments, stained glass from past centuries, and artwork collected over 1,000 years, almost to the point of being overwhelming, St. Stephan's is starkly beautiful, nearly bare, so much so that I almost felt like I could smell the new construction. It did not smell like a medieval church. One of the sad things about the destruction is that the people in that part of Germany were among those who most ardently opposed Hitler. I don't think Americans, on the whole, have the same understanding of the cost of war as Europeans who have grown up seeing those places and the photographs of the damage. 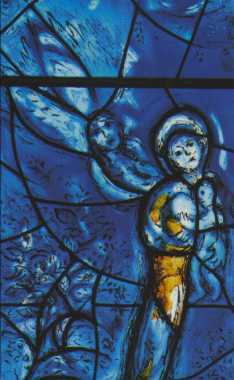 However, St. Stephan's now has the distinction of being the only church in Germany where the Jewish artist Marc Chagall designed a stained glass window. There are several such churches in France, including the beautiful window in the Cathedral of Reims, but the only one in Germany is in Mainz. While Chagall's window in Reims is remarkable for the artist's ability to make his window fit into a church where it is surrounded by much older stained glass windows, Chagall could work with a nearly blank slate in Mainz. The burned cathedral had no windows. He chose the artist who designed the other windows to complement his. From the interior, it looked to me almost like a church that had been built to go with the windows, almost as if the building and the windows had been designed at the same time. It is one of those remarkable things about Chagall's ability to fit together the old and the new that the windows do not look out of place amid much older architecture. St. Willigis is buried in St. Stephan's. St. Willigis's love of art and of architecture make the church an even more fitting location for the twentieth century artists' work. It is a stark, blue and relatively quiet place of beauty (even as other tourists mill around), standing on a tenth century foundation where lies a saint who was known as a perfect bishop in his day. By comparison to St. Stephan's, St. Martin's was loud, a church with an active congregation in the middle of the city center, next to the theater where the Mainz Ballet performs, the center of civic life and tourism, a short walk from the shops and restaurants that attract week-end visitors. If St. Stephan's is a place of visual beauty, St. Martin's is a place of sound, with tourists milling around and talking, the complexity of massive monuments and windows dedicated to bishops and archbishops from many centuries, organ music, and other musical performances. After looking at everything, I slipped behind the door marked for silent prayer only and found another retreat from tourist Mainz and week-ender Mainz to the saints and their medieval city: St. Gotthard's Chapel. 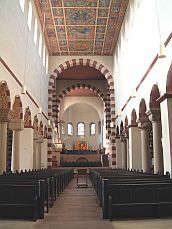 At one time, it was the private chapel of the archbishop of Mainz, one of the most powerful people in the medieval Catholic Church and in the Holy Roman Empire. Now, it is the chapel reserved for silent prayer, where the reserved host is kept. The Romanesque crucifix above the altar in St. Gotthard's Chapel was made in 1070 a.d. It is perhaps the oldest work of art now in the cathedral, at least the oldest one whose date was mentioned in any of the brochures and books that I found. None of the artwork now in either church appears to date back to the days of St. Willigis. Fires, wars, and centuries of deterioration have taken their toll. Bits and pieces of things from the era of St. Willigis can be found, or replicas of them can be found, here and there: the jeweled cover of a book of the Gospels at the Gutenberg museum (a gift from Emperor Otto III to a monastery) and a delicately beautiful reliquary at the Cathedral of Worms (a gift from the Empress Theophanu, the wife of Otto II). But most of the artwork that St. Willigis loved is now gone. In its place are still two beautiful cathedrals and a love of Catholic art and music, and places to pray that still have just enough connection with those medieval saints whose names have been nearly forgotten in present day America. Photos (from the top): Mary and Jesus from the Marc Chagall Window (Lise Mikkelsen); interior of St. Stephen's (Projekt Databroadcast Schulfernsehen); exterior of St. Martin's Cathedral (Stefan Pressler); exterior of St. Martin's (Projekt Databroadcast Schulfernsehen); statue of St. Boniface of Devon/Mainz from outside of St. Martin's (City of Mainz Website); altar of St. Gotthard's Chapel at St. Martin's Cathedral (City of Mainz Website); Crucifix from St. Gotthard's Chapel (City of Mainz Website).